For the dessert I wasn't sure what I was going to make. I love chocolate and my husband's favorite dessert is creme brulee. 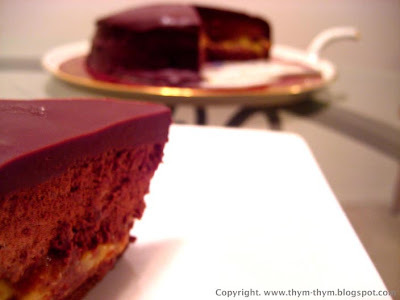 So you imagine my joy when I found this recipe on Flore’s web site .It’s a chocolate entremets that has a crème brulee filling, an almonds nougatine and a chocolate ganache. It's so good. You can find the recipe Here. Your significant other is very lucky!!! That seems like quite the elaborate meal. Makes me feel almost guilty that we went to a retreat for St-Valentine's day. Thanks Cassie for your words.You're right my husband is a very lucky man and I always make sure that he knows it. 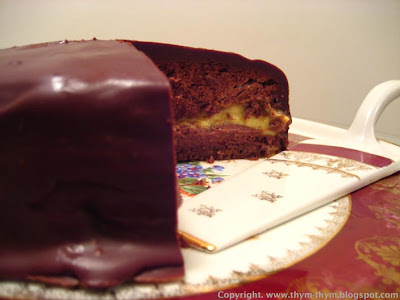 Tu as eu raison de faire ce dessert. Je le connais bien moi aussi et il est exquis! I love creme brulee as well...this looks awesome! I was wondering.. is there any chance of this recipe for the Sicilian to be translated into English? I've searched the internet, but I'm having no luck. Thank you so much Lis. For the Sicilian I will try to translate it for you this week and send it to your e-mail adress.